Things get a little blurry after too many performances. 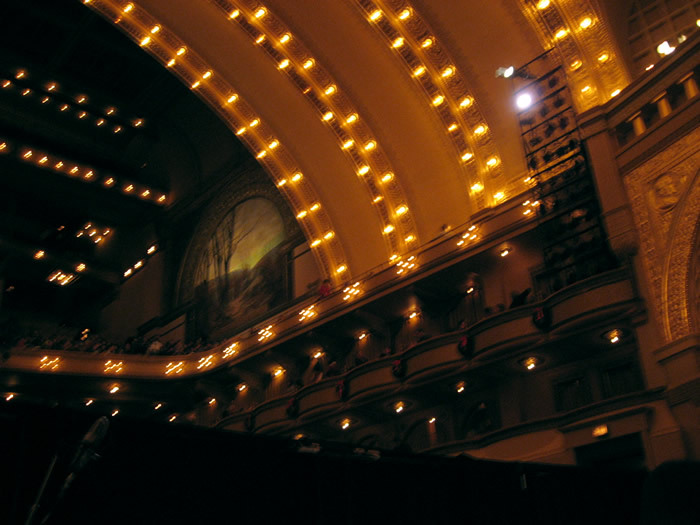 The 2008 Joffrey Ballet production of the Nutcracker ended yesterday, after 14 performances compressed into 9 days. One of the great things about this gig is the venue: Louis Sullivan’s great Auditorium Theatre. I sit almost dead center, right in front of the conductor and facing the audience. So, I get a great view of the architecture and lighting grid, but like most of us in the pit, I can’t see the stage at all. I think I played my first Nutcracker back in ’95 or ’96, with a small company called Ballet Légere, and continued playing with them until 2002. 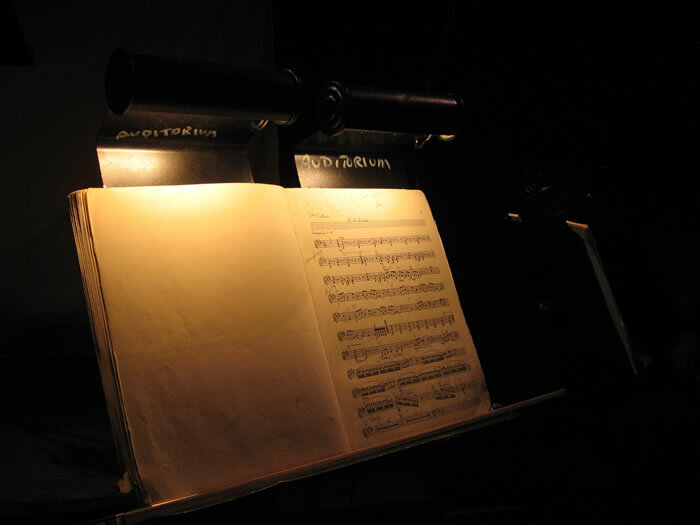 Those productions featured a significantly reduced orchestra (2 first violins, 2 second violins, 1 viola, 1 cello, 1 bass… I’ll spare you the wind and brass breakdowns). This was certainly a great way to learn the ballet, but it also made the Overture particularly hair-raising. My favorite memories of the Légere shows include the cannon, which showered the pit with confetti (there’s probably still some floating around inside my instrument) and the prodigious amounts of fog unleashed for the Snow Scene. At times, the fog rolling into the pit was thick enough to hide the music 2 feet in front of us. I was always really impressed by the high quality of their productions, and miss being able to see the dancers. The remarkable thing is that they continue to hire an orchestra, even though a recording would save them a huge amount of money. Most non-dancers probably don’t understand how nice it is to have a live orchestra, with a conductor that adjusts to match the action on stage. Waiting for Act II to start. The Sinfonietta, as the Joffrey’s “official orchestra” has been performing the Nutcracker since 2003. The larger budget affords a larger orchestra, though it’s still really too small for Tchaikovsky (6 first violins, 5 seconds, 4 violas, 3 cellos, 2 basses, etc.). And, alas, there’s no confetti launched into the pit from the cannon, and any fog is dispersed by a phalanx of fans placed ingeniously at the lip of the stage. So, if you missed seeing this year’s production, be sure to come next year and stop by the pit and say hi. Also, we’re doing The Rite of Spring in February, which you absolutely have to see. ← It’s a Miserable Life! Yes, I remember the Legere confetti fondly…but as I recall it was the small fireball that fell into the second row onto a screaming girl that marked the last time they used flash paper in the cannon. Oh yeah, I’d forgotten about that. I wonder if that girl is still traumatized.